Jacinda Ardern announced Friday that the Labour Party’s new campaign slogan, “Let’s do this”, would replace their previous “A fresh approach”, the tagline for the campaign under Andrew Little. Alongside this announcement, Ardern also pointed to the areas of policy on which Labour would be focusing for the next seven weeks: housing, education, key infrastructure and the environment. She also said the party will be making additional announcements with a Maori focus. With Labour’s housing and education manifestos already released, the remaining question is what sort of infrastructural, environmental and Maori-focused policies Ardern will unveil. While she can only make tweaks and additions to the hefty education and housing policies, the door is wide open for changes to environmental and transport policy, constrained only by the party’s own Budget Responsibility Rules. Environmental protection, transport infrastructure and Maori issues are all also central to the Greens’ election campaign. 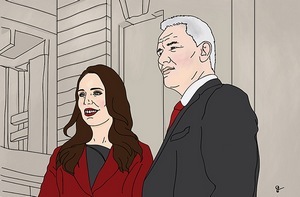 With the struggle to differentiate itself from the Greens evident in Labour's campaign so far, it is little surprise that Labour under Ardern will be moving to take back ground from the party to whom many of their voters have been flocking. The fact that Ardern has chosen these focal points lends credence to the idea that Labour is struggling to win back the ground lost to the Greens over the past few months, as the latter party took left-of-centre stage with Metiria Turei's admission of benefit fraud. It could also simply indicate that these issues are the ones New Zealanders care about most, and that both parties have successfully placed their fingers on the nation’s pulse. Facing a barrage of questions over Metiria Turei’s statement that she would not seek a position in cabinet following her admission of welfare fraud earlier in the campaign, Ardern stressed that the upcoming seven weeks would be focused on Labour’s policies, not the Greens’. Nevertheless, the overlap in focus – moving from policies like Little’s union-driven workplace relations policy to a set of issues arguably more important to a 2017 voting public – is telling for Labour's sudden increase in financial and volunteer support. Clearly the cause of the increase in support is not the promise of new policies, but in the identity of the messenger. Anecdotal evidence from Kelvin Davis in Friday's press conference hinted at what may become substantiated as new polling data rolls out: the 'Jacinda effect' motivating people who are otherwise disengaged from politics to vote Labour. If the party also manages to win over enough lukewarm National voters, this effect might bring the added support necessary to rescue the party from the disastrous 24% support which led Andrew Little to resign. Depending on whether Ardern’s new environmental and infrastructural policies tilt Labour further to the left, or bring them towards the centre, Labour will be looking to win back voters it lost to the Greens and take much-needed votes from the National voter base. In order to stop votes simply sloshing about between the Greens, Labour and NZ First bloc, this is what they must do; Ardern needs to convert 'soft' National supporters if she is to have a shot at forming a government with any mandate after September 23. With the option of tax changes left on the table and the announcement of light rail to Auckland Airport expected on Sunday, there is little doubt that voters will be paying more attention to Labour's policy announcements from here on out. It is going to be interesting when the new Labour leader goes one on one against the National leader. Something akin to the young border collie versus the old black labrador, one imagines. Whatever it is, and regardless of performance, Labour will not get my party vote, unless I am completely confident there is no hidden agenda to increase the tax take, be it direct or indirect. Labour governments have been just too keen and ready to resort to this as the go to book balancer. JA does not want to dish our all her cards ... especially the painful ones, she is leaving that to the end to gather a bit of momentum now ... sugar coated bribes taste good for now , but the ugly face of more taxes will appear soon ...and its devastating consequences on the economy will disappoint after it's too late ... just wait and see! Given the state of the Nation today, and what their team looks like, and the flimsy state of the divided and scattered opposition votes, inviting Labour again to Govern along with the rest of this circus is extremely risky - they need to mature , learn and catch up with the rest .... not sure that they can inspire more voters by jumping up and down on social media ! I say if you want change this time, then it is wise to Vote National. Agreed, completely and the history speaks for itself. The Lange government introduced GST & decreased direct taxation to compensate. The Clark government then just shoved the tax back up again & on the other hand cancelled interest on student loans in order to win an election. They just cannot help themselves. Only there for a moment, Goff straightaway wants a tax on hotel beds. And now a petrol tax, how easy is that. How about instead tackling the billions squandered every year by government departments and local bodies in blatant wastage, ineptitude, crackpot and unnecessary schemes and pet egotistical projects. What was that blow out again on the Ministry of Health headquarters? So many others, it's too depressing to go and look them up. So easy to spend somebody else's money isn't it especially when you can just help yourself. Well if Ardern really wants to stabilize and improve the housing situation for Auckland and the rest of NZ then I strongly suggest that you keep the proposed 'Foreign Buyers Tax' admittedly this is a bit belated since the Auckland property market is already in the process of re-correcting its self now the top end foreign buyer are gone thanks to China's capital outflows restrictions. But it will send a clear message of how much a balls up National made through being impotent and down right lazy, leaving us in a false economy, to the detriment of all our main economies such as exports. Having such an artificially over inflate property market dramatically adds to the over all cost of living and pushes up the NZD which puts pressure on other industries, such as the Tech development as they can't offer the salaries they people need in order to live here, so those companies fold. I've witnessed this at first hand when the international tech company that I worked for moved out for Auckland in 2015 since it was far too expensive to run and compete in the global market place, leaving 150 people unemployed. I know several other tech companies here who are at high risk of folding at the moment. I very much recommend that you read this article as it will help you to understand how the Auckland market became so over inflated along with the other gateway cities such as; Vancouver, Sydney, Melbourne etc.. This is why we need the Foreign Buyers Tax to try to prevent this from happening again. Quote from article: In January 2017, China and the PBoC decided to implement a new round of capital controls. The controls targeted smurfing, and now requires the approval of the use of funds. Real estate buying and mortgage payments in other countries is not an approved use. Foreign sales immediately started plunging in Vancouver, as well as a number of other hubs where Mainland Chinese investors became popular – like New Zealand, and Australia. Toronto's housing market is imploding now as well. This election is a Vote for change. All opposition parties have to do something really bad to lose this election. Same direction, just a Varsity like saying 'lets do it' as a slogan. Obviously aimed at that generation. I wouldn't expect people of "our" generation (presuming a bit here sorry) to "get" it . You may also want to read this article that highlights how much negative impact a high cost of living has on certain industries. Tech salary wise Vancouver is pretty much mirroring Auckland and Wellington, though Auckland feels the high cost of living pressures more than Wellington hence why the tech industry is finding it so much harder to grow here in Auckland. This is why I'm very glad to see the Auckland housing market re-correcting its self. A lower cost of living will allow NZ to be globally competitive with more job creation in vital fields such as Tech development. It will also help our exports and even tourism to flourish with a lower NZD. Here is a home work for you - Let's assume that the GOV will BAN foreign purchase altogether ... no tax, just ban them ... When would you think the collective building forces of public and private developers can catch with the current existing demand ? 3 years, 5 years, or 10 years ?? assuming that there will be no future added demand generated by gen X growing up now?? question 2: Where is Labour going to find the extra billion dollars to fund their improvement claims if they are NOT Going to raise taxes ?? Given that Labour knows very little about providing resources other than by Taxation (proved time and again since day dot) ... everyone now knows the trick of smooth Labour promises - it translates to more tax , collapse tax brackets, property taxes, etc ...the aim is to be in power and prove that they can better manage OUR money. BTW, that tech company moving out of Auckland is a very good thing - 150 people lost their jobs in AUCK. While 150 others were employed somewhere else in the regions so that is great from economical distribution of resources and employment...the 150 in auckland (including yourself) are now happily employed by another firm and most likely being paid more than they did before ... where is the problem?, Or your glass will always remain half empty? I don't think they are trying to win votes off the Greens with the environment policies etc. I would say these are simply unannounced policies that were ready to go, probably due to be announced this week anyway. The greens perceived move to the "left" actually allows Labour to move to the "centre". They can pick up those "Blue Green" voters that would not vote Green because of the "left leaning"
I think Jacinda will pick up young female voters from the Greens, and hopefully ones that wouldn't normally vote. .
Two articles in todays NZ Herald are "heralding" National's government as "stable government"
Well, I suppose that 'consistently corrupt and destructive' could be loosely defined as 'stable'. It's not like they occasionally break out into erratic fits of competence. Both you guys are very cruel. And truthful. This election is National + Media Vs Opposition. Nice Lady is the Jacinda , but as Paula Bennet says "lack of susbstance"
I will sill vote for boring Bill as this stage as he did help Nz OUT during the financial crisis. As for Bill, he had a much easier job having been left those large surpluses by Cullen. Luck of the draw rather than good management, perhaps. What BS Basel Brush - Cullen never left a surplus - he left a worthless billion trainset, and billion $ ACC blowout and $6 billion budget deficits. Don't you remember him crowing in Parliment he'd spent the lot? The left have such sort memories. "National had barely got its feet under the Cabinet table before the Treasury further revised its forecasts and projected deficits of $6 billion-plus. So much for “careful management”. Labour is relying on short memories to rewrite history, however. It won’t fool everybody. But in the heat of an election campaign, it is easy to spout fiction and difficult to establish fact." "Agree, Paula has plenty of substance. ;-)" - the kind of comment that would raise howls from the left if applied to TM. Boring Bill did have to borrow $300,000,000 per week for years to cope with the GFC, the bailout of SCF that M Cullen left him with, and IIRC there was the little matter of an earthquake or two somewhere south of Auckland, you might be able to help me there GBH me old boy. Hindsight is a wonderful thing; I'm glad it was not my job to predict the fiscal future, let alone the Crusader's. It is actually Labour that is busting to borrow to play the sharemarket currently, while lambasting Govt borrowing..
and the odd ACC blowout - "The latest transgressor is Labour’s ACC spokesman, David Parker, who insists former Cabinet ministers were not obliged to reveal a $1 billion hole in the Accident Compensation Corporation budget before the election." and the previous Lobaour administration... "In 1990, 16 hours after he took office as prime minister, National's Jim Bolger was informed by the Treasury and the Reserve Bank that the Bank of New Zealand - then Government-owned - was on the verge of insolvency. " Labour supporters have nothing but BS and selective memory to dish around .. no clear look and evaluation of any substance of what they did and how they did it when in power .. anyone can tax and be frugal to look good in the eyes of the shortsighted to keep them in power - a self-fulfilling attitude! As i said, want change this time?, then Vote National .. the alternative circus is dangerous and so unpredictable . Hindsight . Have you borrowed to the hilt against your house/every other asset at the time to load up on shares ? OK. But seriously for a second - do you really think it is a kind of risk a government should talk on taxpayer behalf ? Well we need to have some productive assets if we are to fund super without raising taxes or forever increasing population (which is not mathematically possible). That is, if we keep this idea of super being for those who need it and those who don't alike. On the other hand, selling off our productive infrastructure assets like power companies like National did, is a certain way to becoming poorer. Nats astroturfers out in force today, phew. Adern has the perfect timing, the Greens are imploding and they will just grab a whole pile of their votes and claim victory.....before the election anyway but the real pre election marker will be how or if the National support changes. Anyone who thinks a Labour/Greens/NZ First government will do better has rocks in their heads. The real, real answer will be how many of the missing million Ardern manages to draw back in. Well Carlos, after 9 years the list of National's achievements must be extensive.